When Callie Rycroft wakes to find purple flames flickering on the ceiling, she believes she’s still dreaming. But soon she’s forced to accept that she has magic―a special magic that grants her entrance into the Faery Realm. For centuries humans have been banned from Faery, but dangerous times call for dangerous measures. Declared Champion by the Faery Queen, Callie is assigned a Guardian, and tasked with finding the Cordial―a magical elixir needed to keep the portal to the Faery realm a secret from humans. The upside? Reece Michaels, the boy she's been crushing on for years, is her Guardian. Callie hopes that, by spending time with Reece, he'll start to see her as more than just his best friend's sister. The downside? She's in a race not only against time, but against another Champion, and a rogue Guardian―a Guardian who stands to threaten her developing relationship with Reece. Magic, mistaken identities, and hidden agendas are the least of Callie's worries when she learns that the Cordial requires a sacrifice. Will Callie be willing to risk everything―even Reece―to complete her task as Champion? Or will she let the portal open, and doom both realms? Mary Waibel writes of a riddle and a challenge to save the Faery Realm in her new novel, Faery Marked. A human has never been chosen as Champion before, but Callie bears the winged mark. With her Guardian to help her, Callie has one week, after she takes the oath, to unravel the riddle and find the Cordial, ensuring the safety of Faery. Callie is an orphaned teenage girl, living with both her brother and foster brother while finishing high school. Just six months ago, she was in a terrible car accident that killed both of her parents. Still dealing with the guilt and mourning her loss, Callie is trying to focus on her future. Until she learns of Faery and her unexpected task. Readers will like Callie as she's a typical high school girl. She isn't stereotyped into any specific group, which makes her more relatable. She's intelligent and brave, willing to risk her life to find the Cordial. Though, I was disappointed in how she treated her best friend in the book, Alyssa. Even if Callie needed to keep her Faery quest a secret, she shouldn't have lied to her best friend and avoided her. Perhaps an all encompassing "I'll explain later" would have sufficed. 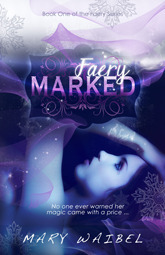 The plot of Faery Marked was fast paced, beginning with Callie's discovery of her awakening powers. Without hesitation, she is taken to Faery and is required to take an oath for the Cordial quest. Soon after, Callie returns and begins training with her Guardian. While trying to crack the riddle, Callie is attacked multiple times and the threat of failure is mounting. But as with most beginnings of series, things don't wrap up nicely in the end and, suddenly, the threat of failure isn't the scariest possible outcome. 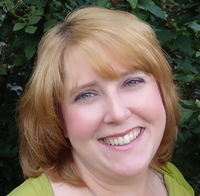 YA author Mary Waibel’s love for fairytales and happy-ever fill the pages of her works. Whether penning stories in a medieval setting or a modern day school, magic and romance weave their way inside every tale. Strong female characters use both brain and brawn to save the day and win the heart of their men. 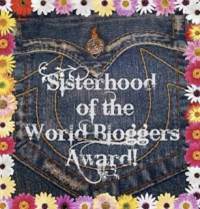 Mary enjoys connecting with her readers through her website: marywaibel.blogspot.com. !Available December 16th from BookFishBooks! Thank you so much for your review. I'll keep in mind what you said about Callie's treatment of Alyssa and work at tying that into the next book.